Essentially England News - What to feed an army? What to feed an army? It's October! Where has this year gone? Regardless, I'm Sue from Essentially England. This is the October edition of Essentially England News and I hope you're all well. October is usually the month for my Norman History obsession to stick its head up, but it's been surprisingly quiet this year, because everything else has been so busy. Until today, that is, when I was chatting with some friends on Facebook about the way to serve baked potatoes, of all things! But at least now I know what to expect if I'm visiting the US and encounter a loaded baked potato or a potato with all the fixins. It sounded delicious, but probably like something I'd only want if I'd been fasting for a week, and that made me suddenly consider the logistics of the Norman Invasion. Yes, I know... my mind is like that. Back in 1066 there were no supermarkets or convenience stores, and potatoes, pasta and even leavened bread weren't around yet. It was autumn in England, which could mean anything from a balmy, sunny afternoon to a sleety, wet one. Or days of rain, which is infinitely worse. It'd be chilly, and probably foggy, in the mornings. And even if the day was sunny, temperatures would drop as soon as the sun went down. Add rigorous exercise with heavy loads, and sleeping under the stars and you end up with a simple fact: people needed a lot of food to keep warm and to keep going. We know that dinner, served around noon, and supper, served around 4-5pm, were the principal meals of the day. We have the "shopping lists" for medieval coronations and wedding feasts, so we know about the thousands (literally!) of chickens and geese that were ordered months in advance, about sheep, pigs, and cattle that were needed. About the huge quantities of beer and wine, and the mountains of grain to bake bread. Events like this, that involved a huge crowd of people, had to be planned for long in advance. So how about an invasion? Armies, both attackers and defenders, are made from huge crowds of people. William of Normandy didn't have all that long to prepare his invasion. Edward the Confessor died on January 5th. Harold was crowned on January 6th. 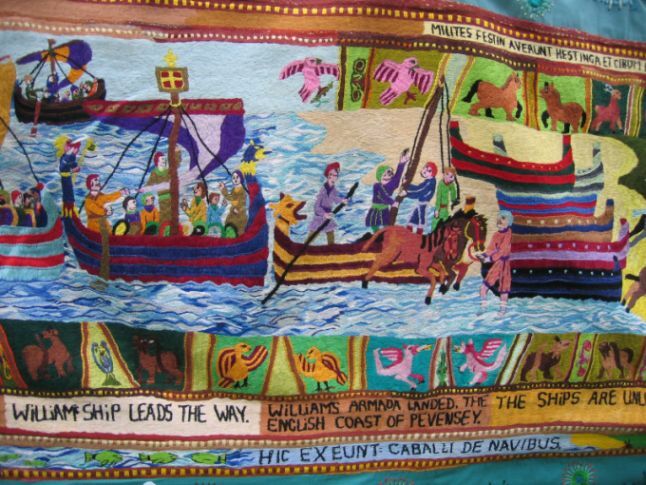 William had to decide to invade, gather men and arms and supplies, build ships, get approval from the pope, dedicate his daughter to a nunnery to curry the favour of the Almighty... and he landed in England on September 28th despite being trapped on the French coast by unfavourable winds and losing part of his fleet - men and ships - in a storm. 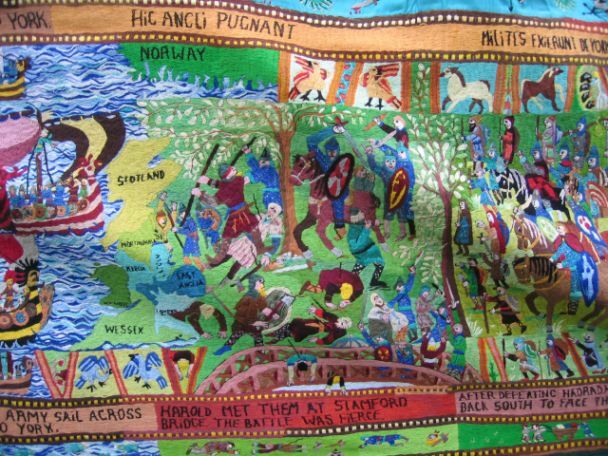 Then he had to bring his troops ashore, build a fortification at Pevensey before marching them all to the site where he'd face Harold on Senlac hill...and he was on enemy soil and couldn't rightly expect any help from anyone. What kind of provisions did he bring to feed his men and their horses? And Harold ...the king who was attacked from two sides and didn't have a standing army besides his household troops? He'd called up the levies and had them stand watch along the south coast awaiting William's invasion. When no invading army appeared, he had to let them go home, because - after all - it was harvest time and every hand was needed. And when things did start to happen, he had no time to prepare. He got news that Harald Hardrada, the Norwegian king, had landed in Yorkshire. He gathered what men he could, marched them north at speed and gave battle, before racing his whole army south again to confront William, who'd turned up like the proverbial bad penny while Harold was busy up north. From both sides, the invasion was a true feat of logistics, and I find it interesting to consider how they'd kept themselves adequately fed! But thinking about Harold's mad dash north and his race south to protect Anglo-Saxon England from invaders made me consider food that could be eaten on the run and food that wouldn't take long to cook when the tired troops did make camp. Porridge came to mind or some kind of gruel made from ground grains that would cook quickly and offer a hot, filling meal. Part of me imagines balls of pease pudding, so thick it had grown solid as it cooled, carried by the soldiers wrapped in cloth. Reheated with water and slices of bacon, it would have made a hearty dinner... like an Anglo-Saxon version of instant soup! The troops probably carried dried or cured meats with them. Bacon, ham, beef jerky. And maybe villages along the route provided bread and sausages, milk, cheese, eggs and what chickens they could spare. It would have been a hard march, and probably a hungry one, too. As for William and his troops, I think I need to hunt up a few new books to find out, but that's not really a hardship. And if I find anything interesting, I'll let you know. Until then, please take care. And why not join us on Twitter or Instagram and LIKE us on Facebook? I'll be very happy to see you!